This Manus Island soap opera is just getting more and more ridiculous. Lefties in Oz are milking it for all it's worth. And they can do this because events are unfolding a long way from the mainland. They can tell the most brazen lies about goings on there and basically get away with it. They aren't quite as bold when it comes to stuff going on in our cities because even though most of the local media are happy to echo their simplistic, OTT narrative without question there are some journos who ask pertinent questions and collect evidence disputing their outrageous claims. 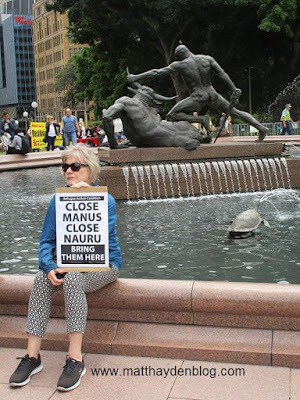 Recently, they've all been shrieking up a storm about efforts to move the so-called refugees from the old centre on Manus Island to a new one. This would be a pretty straightforward process if the occupants were cooperative. But instead they've been as obstructive as possible (encouraged by activists, no doubt). The authorities have lost patience and are using force. That's unfortunate but understandable. Local activists are carrying on as if it's the most terrible thing that could possibly happen. Sooo typical of them, innit? Doesn't matter what's really going on. Socialists will always be weeping, wailing and gnashing their teeth zif the sky's about to fall in. They're always doing their damnedest to demonize their opponents. Also, they're getting off on the drama of it. They're screaming: "Pay attention to us. We're important! Look how much we care!" 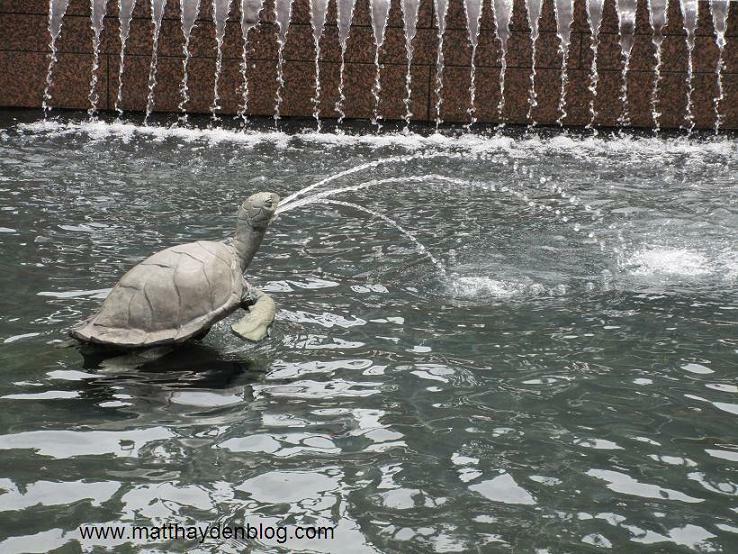 Saw some of this on the weekend down at Hyde Park. There was a rally in support of the men on Manus, see. Like all leftie demos, it was full of incoherence and virtue signalling. Lots of silly signs and behaviour. A real show. The banners were emotive as usual. They'd only appeal to people who don't think too hard about things. The Greens advocated policies that resulted in over a thousand people drowning. Calling them "compassionate" is bloody absurd, clearly. And by the same token, is it "cruel" to prevent these deaths, even if this is achieved by unflinching application of harsh border policies? Hell, they're the only measures that stop people smuggling. Not pleasant but they do work. But there were some colourful characters there, I gotta say. It's something you often see at leftie gatherings. Take this magnificent old dude, who woulda looked right at home in a biblical epic. Coulda been the good lord Himself! 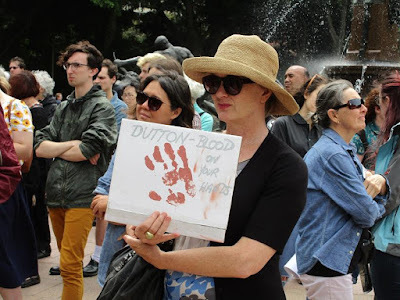 Dutton has blood on his hands? What, for enforcing a policy that has been proven to save lives? But those whose demands ultimately lure people to their deaths are the good guys ... Got it. I quite like this photo. Seems symbolic somehow ... One interpretation: there's violence and suffering everywhere. 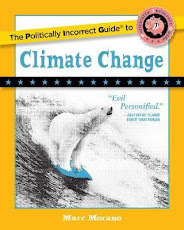 By focusing on hyperbolic (and sometimes flat out fraudulent) claims about what's happening a long way away, you could be missing something far worse much closer to home. 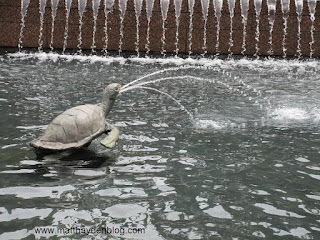 Not sure what significance the turtle had ... Maybe he'd endured so many of these sanctimonious rallies over the years that he'd just had a gutful? Interesting that leftie activists are forever waxing lyrical about love and compassion. 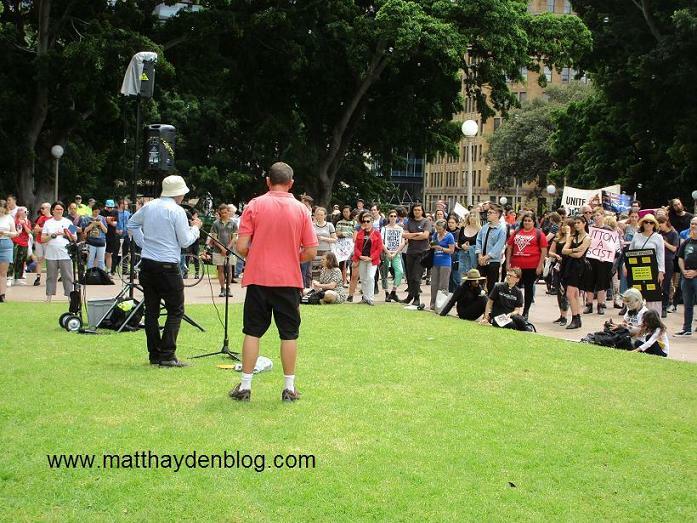 The rally's speakers were clearly driven most strongly by emotions like anger, disgust, rage, contempt, and indignation. Take the guy in the video below. He was the organizer, an academic who writes for The Guardian. Bloke was brimming! Can you imagine him being able to discuss the issue of border control calmly, even without his powerful sun hat of social justice? 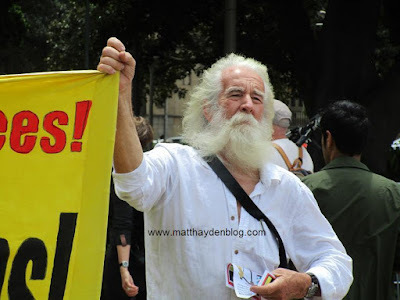 Nick Reimer is also a member of Ian Rintoul's "Solidarity", a Trotskyist group. Nice people they have teaching our kids today. Great coverage Matt. 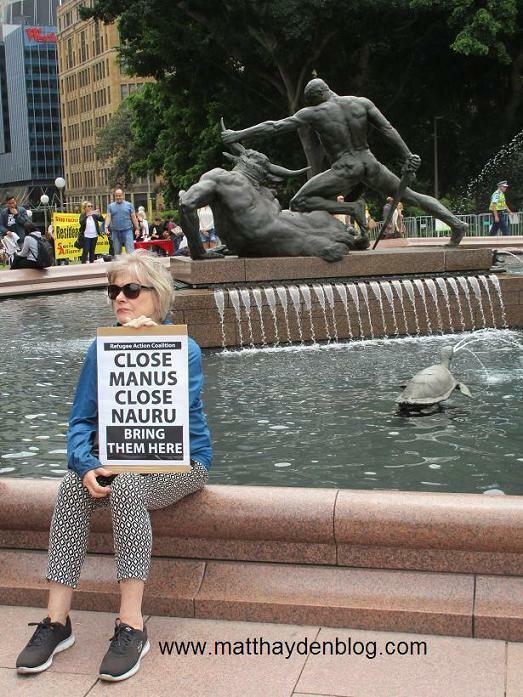 I especially like your photo of the Archibald Fountain with the woman perched on the edge delicately holding her sign. The juxtaposition with Theseus and the Minotaur in the background sets the message off perfectly. Strange that nobody has challenged the assertion that Manus people will attack the "refugees" as soon as they step out of the old compound. Firstly the old compound is no longer secure, the locks having been removed, so any machete-wielding local could come in if they wished, and second, contrary to the popular image of Manusians, they are generally friendly and easy-going. 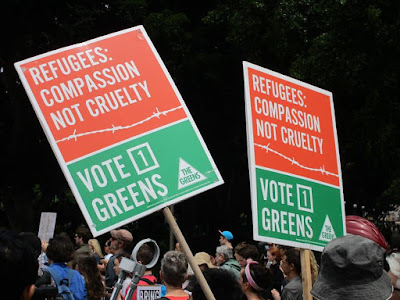 My Manus friends tell me most of the violence has been in response to specific incidents in which locals have been treated with contempt or their women-folk molested by the "refugees". While not condoning violence, I would guess the Manus people's response has been similar to the treatment that would have been meted out in the "refugees'" home countries under similar circumstances.